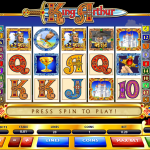 King Arthur is an older Microgaming slot which follows the life of King Arthur and his quest for the Holy Grail. This is a popular theme in the online gambling industry as well as in the world. For this slot the Microgaming designers decided to go with a vintage design, just like you would see in a land based casino. Since this is an older slot the animations are low, but the symbols have great details and the colors are vibrant. This is a fun slot to play thanks to the several bonus features which make the game play attractive. 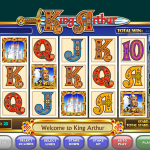 King Arthur is a video slot game with two Wild symbols. The first is a regular Wild represented by Merlin, while the second is a x2 Wild which is King Arthur himself. Both wilds will substitute for all other symbols except the scatter and bonus, while the x2 wild will double any payout he contributes in. The scatter symbol in the slot is Excalibur. He can land on all reels and will award a x2 stake multiplier. This way if you manage to land 5 scatters on the reels the total multiplier will be x32. The bonus symbol in the slot is Camelot. Once 3, 4 or 5 bonus symbols land on a pay line the Camelot Bonus is triggered. In this feature King Arthur sets out on his quest to find the Holy Grail. You will need to choose the path which Arthur will take and he will decide which side to take on the junctions. You can multiply your bonus winning by x4 if you manage to collect the multiplier along the way. 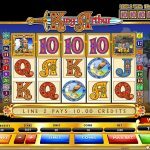 Despite the vintage design King Arthur is a very interesting slot game. The two wilds and the two bonus features can produce nice payouts which can gradually increase your balance as you spin the reels. If you didn’t like the last one then you should consider playing Jewels Of The Orient a 5 reel slot by MicroGaming.